Well I am HOPING now that it is starting to get cooler outside that I will update my blog more often! We have had such a fun summer that I haven't done much inside! I went back to work in June so Austin started daycare again! The first few weeks were a bit rough but I am so grateful that he doesn't throw a fit to go anymore! He loves to play with Julie and all of his friends there! He always has a lot of fun stories to tell me every night about his adventures at daycare! We also just recently tackled potty training! Austin finally decided he wanted to go on the big boy potty and just like that I was able to put him in underwear! As of August, 1st he isn't having accidents anymore. I am SO proud of my BIG boy! I just love him so much! It is so funny because now when we are in public and we have to run to the bathroom Austin always says oh mommy you are such a big girl for using the potty! It always makes everyone around us laugh and I think it's pretty cute too! Also, I started giving him a reward when he would go potty on the toilet so he still asks if he can have a treat every time he is done! We usually stick with a few m&m's or smarties since they are small! 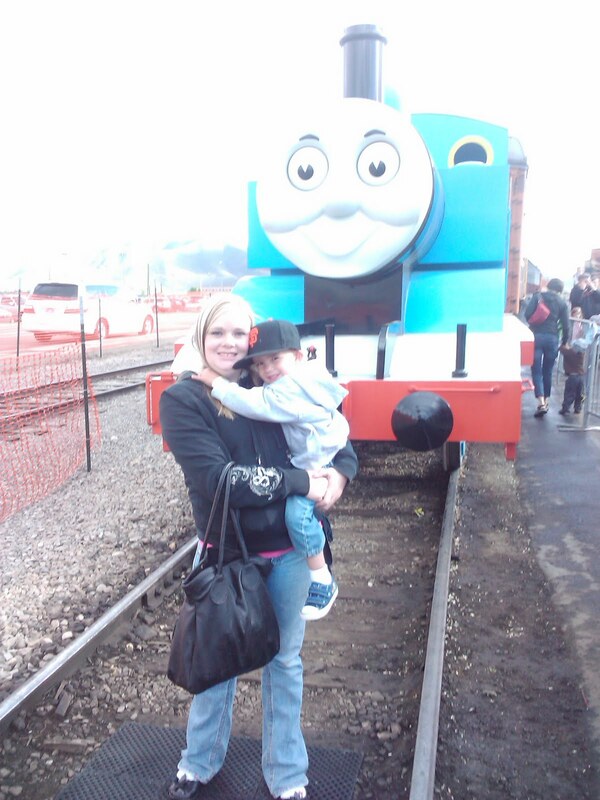 We met Thomas the train! It was such a fun day out! First we went to a little restaurant that I remember going to growing up. They have the BEST ice cream and gave the kids cute Thomas hats! After that we went to see Thomas. They had so many activities for the kids to do. They rode the train, met Sir Topham Hat, got balloons and had fun being crazy! We also have LOVED to go swimming this year! We usually just throw our swimsuits on and play in the backyard... but we packed a picnic lunch and went to the rec center one sunny day! The kiddie area is so much fun here. They have slides, dump buckets, fountains, water guns, and so much to do. The kids had fun all day. I wanted Austin to try and go down the slide but he wouldn't try without me. So here we are going down the slide and he was SUPER mad. As soon as we got down he started yelling at me. I thought it was super funny and I love the picture of him mad. I love that he has a personality of his own! These two are such trouble makers together. They are best friends and love each other so much! Here they are enjoying our picnic being cool! 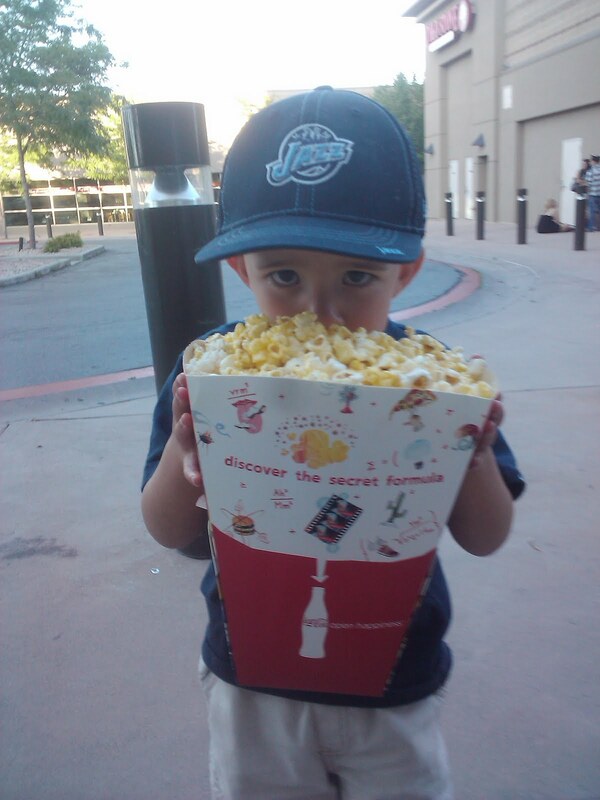 We LOVE going to the movies! We went to see the new Shrek with Tyler, McKaylee and McKenzie and it was a blast. Austin loves going to the theater and he is always good during the whole movie! Austin is always so funny with the popcorn. He can eat so much of it... he is a popcorn pig! This is one of my favorite pictures of him because it is just like him! Even when we have movie night at home the first snack he wants is popcorn! I also took Austin to the Drive Inn for the first time! I was worried how he would act but he was so good! 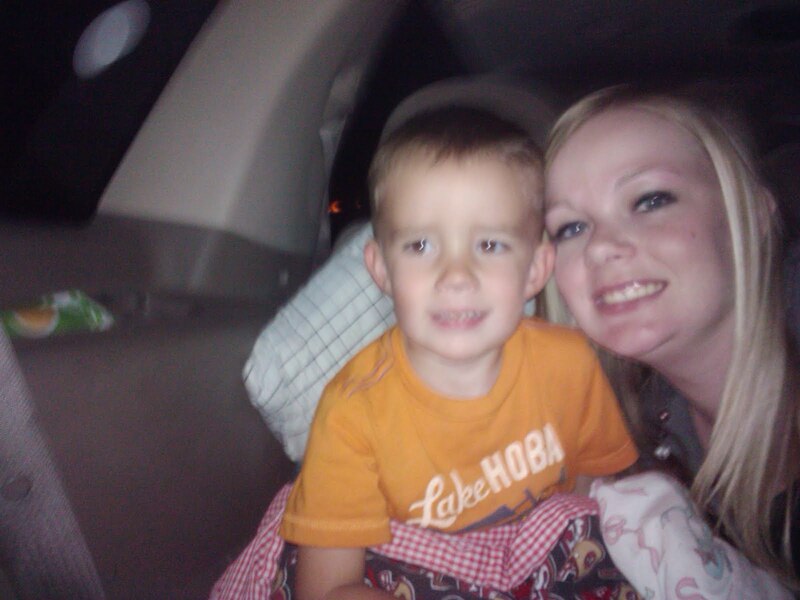 We went and saw Toy Story 3 and Despicable Me and he stayed awake for both of them! Now he always asks if we ca n go back to the movie in the car! He is so stinkin cute! The picture of us at the Drive-Inn is a little blurry but it's the only one I have so here it is! Well we have had so many other adventures this summer... we have went fishing, camping, to the lake, the zoo, carnivals, parties, and so much more! It has been such an amazing summer with family and friends and I am so grateful to have the cutest boy to share all of this with. He is my whole world and every minute I spend with him I cherish! He is such a sweet, smart, funny, adorable boy! I am so sad that he is getting big but looking forward to watching him grow!